Buying custom golf clubs is the best way to ensure your clubs fit your game perfectly. Golfers come in an assortment of sizes and shapes. Some are tall with long arms while some are small with short arms. Some golfers hit the ball high in the air while others can barely hit it off the ground. Everybody is different so here at GlobalGolf, we think your golf clubs should be unique like you. 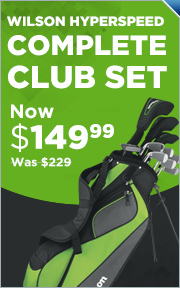 Customization gives you the ability to receive a club built to your individual specifications. The product page will ask you for which hand, lie, and loft angle you prefer as well as which shaft and grip that works best for you. Any golfer who is serious about improving should consider custom golf clubs so that their equipment best fits their individual game.